Raises again why there is an apparent absence of outrigger use in Europe. Some double dugouts but no outriggers. There are some top planks with holes that could have mounted outriggers but as far as I know that is all. 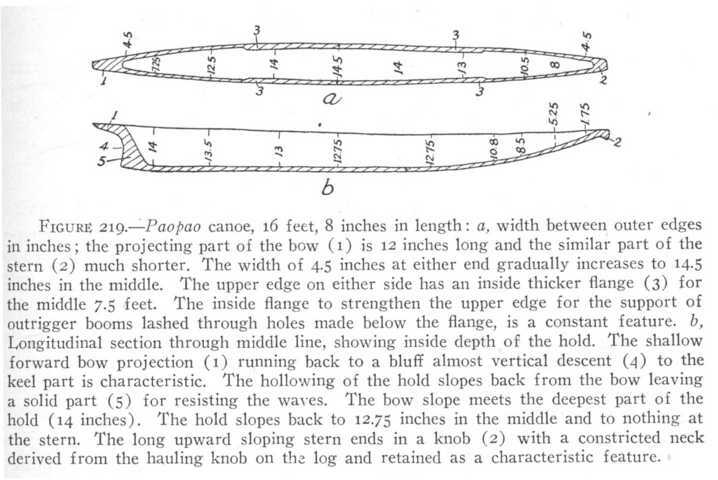 The silly thing is that anyone paddling a canoe is aware of the support available from an extended paddle so the principle of the outrigger would be obvious from that, likewise the benefits from two canoes "rafting" up. Of course it possible that skin boats were used so extensively, sewn planks boats of stable breadth came in and only self-sustaining logboats were ever made so an actual need for outriggers never developed. In many ways the development of the planked boat was the way forward for the creation of ocean-going ships. Skin and outrigger were wonderful dead ends. And I want a paopao please for my birthday. Edwin: My guess concerning the absence of the outrigger from Europe is that the leap of imagination simply didn't occur. 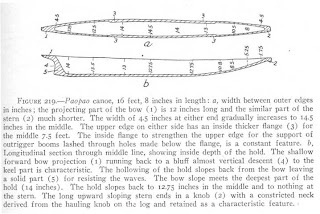 As logical and self-evident as it appears to us, it required a new intellectual construct concerning the way a boat is "supposed to work," and for whatever reason, no one came up with or properly developed that idea -- for the same non-evident "reasons" that North Americans never used the oh-so-obvious sail, and Pacific Islanders never used oars for propulsion. Indians used leafy branches as sails as may have been done in Bronze Age Scandinavia.